Review: Leistner Premium Collection (and flash sale)! Fans of fancy brushes, put on your seat belts – Leistner has outdone themselves this time! I’ve carried on quite a bit on this blog about how great the Leistner line is in general, so I’ll spare you all of that weird grooming-product worship again. But, uh, for real though… they’re amazing. Yes, brushes can be amazing, I promise. Everyone else in Blogland that has bought some (*cough* Aimee *cough* Leah *cough* Karen) can back me up on that. 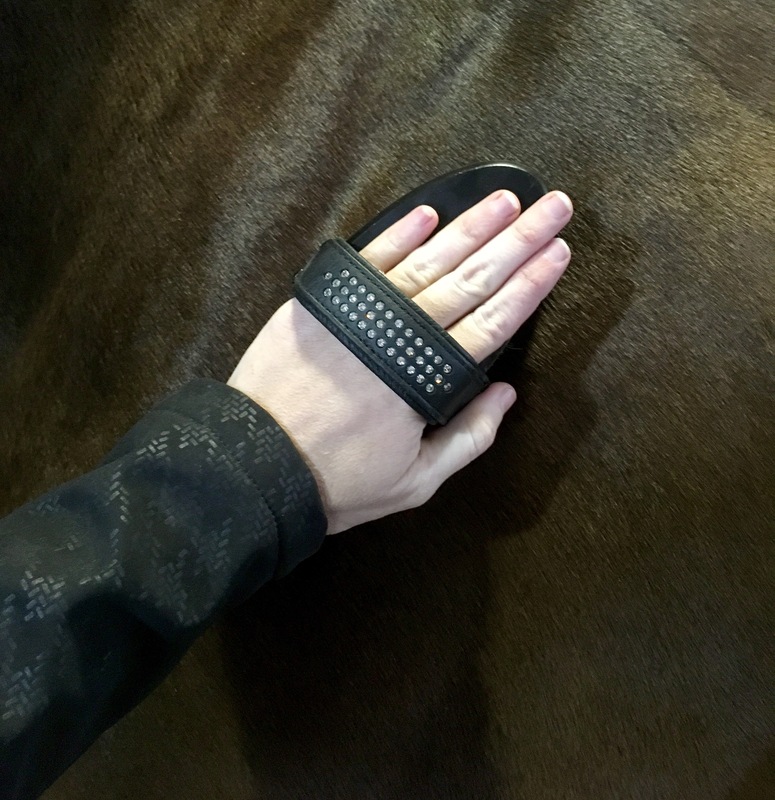 So when Toi at Teddy’s Tack Trunk contacted me about something new from Leistner that she was carrying, I got really excited. And well, it was warranted, because omg these things are insanely beautiful. I can’t even get a photo to capture how pretty they really are in person. The Premium Collection from Leistner basically takes their standard (awesome) brushes and makes them super fancy. They have an upgraded finish and gorgeous padded leather handle. If you’re looking for a gift for that hard-to-shop-for horse person, look no further. This is where art meets practicality, and for under $40. 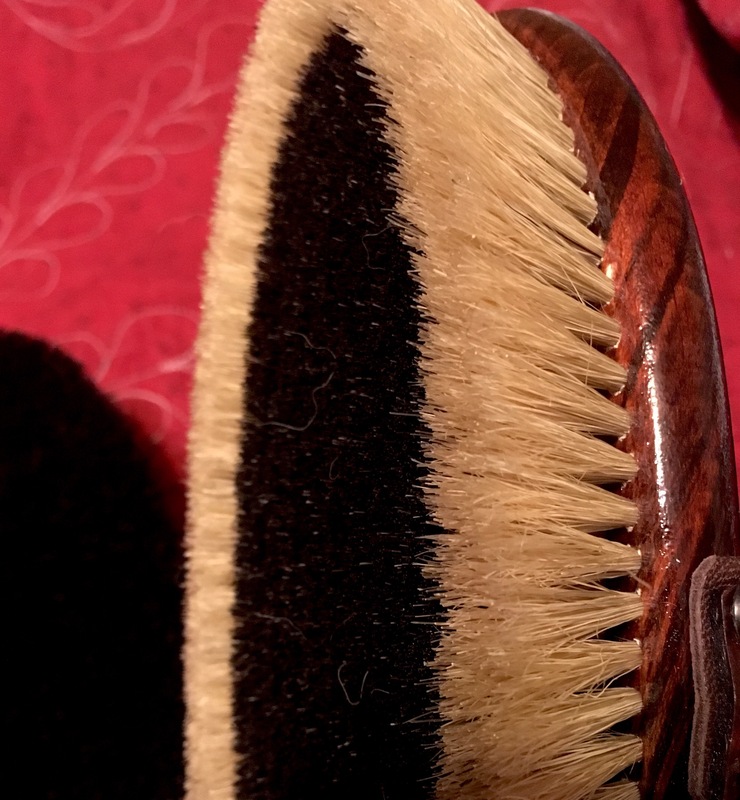 Currently Teddy’s Tack Trunk is stocking a few different Premium Collection brushes (although you can special order any brush with upgraded straps). I got two – the Satchmo and the Beauty. The Satchmo (a 100% horse hair medium-soft bristle brush) has a glossy black finish and padded black leather handle with lots of real Swarovski crystal bling. I’m pretty sure this should be required equipment for every DQ. Not only is the brush itself very functional, the finish is perfectly executed with luxurious leather, soft padding, and very firmly-affixed rhinestones that are set down into the leather. As soon as Toi told me that the Satchmo is Emma Ford’s brush of choice for quarter marks, I was sold. It’s now got a starring role in my fancy-pants show brush collection. My other Premium brush is the Beauty (100% horse hair medium-soft brush with a lifted edge), with a rich brown wood stain and padded brown croc-embossed handle. The Beauty is very similar to my beloved Prinz brush, but a bit bigger, making it the perfect go-to brush for every day use. May as well have a super fancy brush for daily use too, right? Every day is Treat Yo Self. BTW, apparently the padding on these is elk leather… who even knew that was a thing? Life lesson: elk are apparently very soft. Here’s the fun part: TODAY ONLY get 10% off the Leistner Premium Collection brushes from Teddy’s Tack Trunk with code PREMIUM10! Next Back at it! XC schooling edition. Those are beautiful! I think I need the Beauty in my life. Before the Leistner brushes I was the same way… all my grooming stuff was super neglected, didn’t get cleaned very often (and never properly), and just got tossed about. It’s funny though, when you have something really nice that you love, taking care of it just comes naturally lol. until i scrolled down and saw the crocodile handle one and OH MY LORD IM IN LOVE. I love all of my brushes from Toi. The one you got me was like a gateway drug haha. I think I have 4 now… maybe more. These are both great. I might like the Satchmo just a taaaaad more because I didn’t have one quite like it in my collection already, brush-wise. The finish on the Beauty is ridiculously pretty, though… I’m partial to brown! Oooooooo I want that second one. My Prinz brush is definitely my go-to for sensitive princess pony and that is gorgeous! Actually the rhinestones are “embedded” into layers of leather, so the stones sit flush with the top layer of leather. You can kind of tell what I mean if you look at the first picture closely. Pretty brilliant! These brushes really are awesome! I’ve had a few for a couple of years now, and wouldn’t go back to any others. These are so pretty! Definitely in the want not the need column. But hanging around the list nonetheless. My problem is my ponies all get their own brushes, so I just can’t justify buying four of these at once.